The issue of mass graves in Mannar continues to remain an inconclusive hot topic, despite the radio carbon dating analysis report received from the Beta Analytic Testing Laboratory in Florida, USA., which cleared the Sri Lanka Army of responsibility, by declaring the skeletal remains referred to the Laboratory pre-dates the country’s bloody civil war by at least six hundred years, which take us to the periods of Portuguese and Dutch rule of the 16th and 17th centuries. A few disgruntled political elements in the North, backed by certain foreign-funded local NGOOs who had been quite confident of the outcome of the Florida laboratory tests, are now clamouring for a second opinion. They will not be contented until some overseas technical laboratory could be made to express the opinion that the skeletons recovered from a construction site in May 2018 are of recent origin, and could be civilians and or LTTE cadres the Sri Lanka Army is accused of killing and burying during the war which ended in 2009. 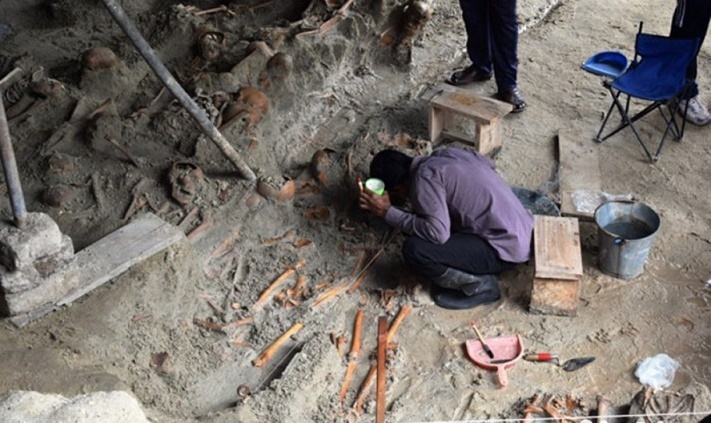 The UN High Commissioner for Human Rights as well as the diplomatic representatives of certain western countries may not relax until some foreign laboratory rules that Sri Lankan armed forces are responsible for the skeletal remains in the unearthed mass graves. The UN High Commissioner for Human Rights believes that other grave sites might be found in the future and, therefore, in her recent report to the Geneva assembly has recommended that the capacity of the forensic sector be strengthened; including in areas of forensic anthropology, forensic archaeology and genetics, to carry out proper investigations on them. Students of Sri Lankan history are aware that when the Portuguese arrived in this country at the beginning of the 16th century, and engaged in battles with the local Kings to take control of the maritime region and the hinterland, the poorly armed locals were defeated and dealt with most ruthlessly. They were subjected to torture, mutilation and mass killings causing bloodbaths in the numerous confrontations they had from time to time. The poor citizens who offered resistance were put to death in large numbers without any mercy. Accounts of a few of them extracted from certain published historical records are reproduced in this note to indicate that these tragic events inevitably required mass burial sites, into which the unfortunate victims were dumped. When human beings antagonistic to the conquerors and masters are mercilessly killed in large numbers by the victorious elements, the victims will not have the privilege of individual burials as resting places, but inevitably mass graves only deep enough to prevent the stench emanating from decomposed bodies from polluting the air around the areas in which they have been dumped. Extracts culled from a few historical records, reproduced below, may enable right-thinking, discerning and impartial observers, at least at this stage, to come to the unavoidable conclusion that the origin of these mass graves date back to mass killings and blood baths which resulted from the numerous battles the invading Portuguese had with the ill-equipped local armies in the 16th century, rather than due to the long-dragged war which ended a few years back. ( Mannar island had been an important part of the Jaffna Kingdom, which the Portuguese were eager to possess, especially in view of the Pearl fishery which was regarded as a gold mine in the then trading world ). The extracts reproduced in this note also include a couple of paragraphs from a 17th century manuscript written in Portuguese by a senior clergyman named Paulo da Trinidade, of Portuguese descent. The material extracted from this account is of greater significance since it has been compiled around 1636 AD i.e. relatively soon after the mass killings which had taken place in the 16th century, and therefore its accuracy and authenticity cannot be in question. “Early Christianity in Ceylon – a 17th century narrative” which is the title of this English translation has been the work of Rev. Dr Edmund Peiris, who was Bishop of Colombo and well known scholar, and a Franciscan missionary Rev. Fr. Achilles Meersman, who was based in India. The translation published in 1972 is limited to the chapters on Ceylon in the original manuscript titled ‘Conquista Spiritual do Oriente’ (meaning the Spiritual Conquest of the East). According to Dr. Edmund Peiris, only one copy of the manuscript of this Chronicle of 1193 pages remains and is preserved in the Vatican Library in Rome. The section on Ceylon, in translation, spreads over three hundred pages grouped under 56 chapters. They deal mainly with the confrontations the Portuguese missionaries encountered in attempting to convert the local population (liberally referred by them as pagans) into Christianity. It may be worth noting that while the many hundreds slaughtered by the King in the distant 16th century included children; the 328 skeletons unearthed in Mannar in 2018 too included skeletons of children. As the UN Commissioner for Human Rights believes that further mass graves will be opened up in the near future and to investigate them the forensic apparatus has to be improved and polished up, a couple of further clues are given below about some other sites possibly containing more mass graves, which had come into being in the 16th century. One of them specifically refers to the Mannar massacre. They are extracted from the “History of Sri Lanka, Volume II” published in 1995 by the University of Peradeniya. “De Oliveira and the other Portuguese inhabitants were spending the night in vigil and prayer. Their devotions were interrupted by the arrival of a messenger…announcing… that the commander of the Tamils was slain and that they had cut off 500 heads.…A second letter followed; eight hundred heads had now been cut off… by ten o’ clock a third message arrived; 1,200 heads had been cut off…”(p.137). Do the UN Commissioner for Human Rights, Diplomatic representatives of some Western countries, the NGOOs and other dissatisfied elements believe that the perpetrators of the above gruesome killings, committed either by the King of the Jaffna Kingdom or the invading Portuguese, buried the poor victims with State honours in individual graves ? Cannot the skeletal remains discovered so far from mass graves, be the skeletal remains of the above confrontations to secure the Jaffna Kingdom, apart from those massacred by the King for embracing a new Faith ? These tragic events which occurred several centuries ago have been highlighted only to correct a mischievous, distorted view forced on the gullible elements and to expose the well-designed canard jointly crafted by local and foreign elements long after the conclusion of the War, that the Mannar mass grave is the work of the Sri Lanka Army which brought to an end the uprising of the LTTE, widely referred to in the West as the most ruthless terrorist group in the world. The only mass grave resulting from the war waged against the terrorists, which the public are aware of, is the mass grave into which the bodies of 600 police officers attached to several police stations in the Eastern Province, who had been made to surrender had been were brutally killed by spraying machine gun bullets to the back of their heads by the LTTE and dumped on the 11th of June 1990 off the jungles in Trincomalee area. As the bodies of victims are reported to have been burnt after spraying oil on them in a Valley of Death, it may be that most of the skeletons may have been reduced to ashes. When the UN High Commissioner for refugees recently referred to the possibility of further mass graves being opened up, it is doubted as to whether this site too was at the back of her mind. As no reference has been made by any international human rights activists or even by the local NGOOs about this gruesome mass murder, it may be that this incident may not be recorded in any of the files or records maintained in the UN agencies. Even if records exist, the UN investigators have the convenient excuse not to probe as their mandate is limited to probe into war crimes “committed during the last stages of the conflict”. The year 1990 was 19 years before the war came to an end. At least now, in the face of the rich and cast-iron evidence as listed above; the weeping NGOOs, disgruntled elements in the North, the several foreign diplomat-uncles and other foreign foster parents concerned, who are weeping buckets of tears regarding the alleged blatant violation of human rights by the Sri Lanka Army, should stop chasing a mirage and select some other issue to keep themselves gainfully occupied.